Photo above is for illustration only. See below for items included in each package. Blue Wave kits save you time and money! Each kit contains everything you need to easily open your pool – no measuring required. 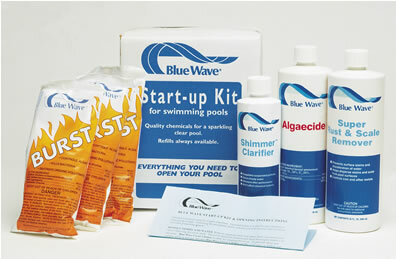 Blue Wave’s kits contain everything you need to get started this spring. We’ve pre-formulated and pre-measured each kit to fit your pool size. All you have to do is pour each product into the pool as instructed. Plus, unlike other kits, Blue Wave “packs a punch” with super-strong BURST (dichlor) shock. After the winter months it is important to rid your pool of the dangerous bacteria and contaminants that have built up – BURST will do the job! Each kit comes complete with pool opening instructions. Choose the kit that best fits your pool size (see contents below). Remember that the liquids in each kit have been concentrated for a single dosage in your pool size. For Pool Season's Chemical Packages (including chlorine tabs) click here !